Turmeric Latte has a delightful "sunny" yellow colour and wonderfully milky-sweet flavour with a slightly bitter finish. The spicy scent of ginger reveals a true flavour explosion on the tongue that sends tantalizing warmth throughout the body. A perfect breakfast drink or pick-me-up in the afternoon, this unique blend is an Ayurvedic classic. It looks exquisite when topped with creamy milk froth. Enjoy this wonderful organic spice blend. 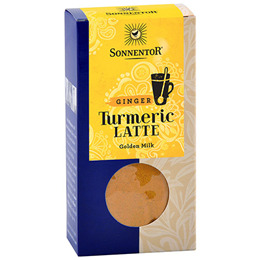 This product is a refill for the Sonnentor Organic Turmeric Latte Tin - Ginger. Old knowledge and new ideas form the fertile soil for Sonnentor`s diverse range of natural delights. Since 1988, delicious products have been growing under their laughing sun logo. Each and every one reflects Sonnentor`s respect for manual work and their appreciation of people and nature. 100% organic: turmeric 53%, cinnamon Ceylon, ginger 15%, nutmeg, cardamom, pepper black, saffron. Add 1 tsp of Turmeric Latte mixture (about 2g) to 250ml (plant-based) milk, heat and sweeten. Ayurdedic preparation: Add 1 tsp of turmeric paste* to 250ml of (plant-based) milk, heat over medium heat and simmer for 4-5 mins. Refine with 1 tsp of coconut oil and sweeten to taste. *Turmeric paste: combine 1 heaped tbsp (about 8g) of Turmeric Latte mixture with 30ml of water and simmer until a paste is formed. Keep paste in the refrigerator. Spices do not dissolve completely. 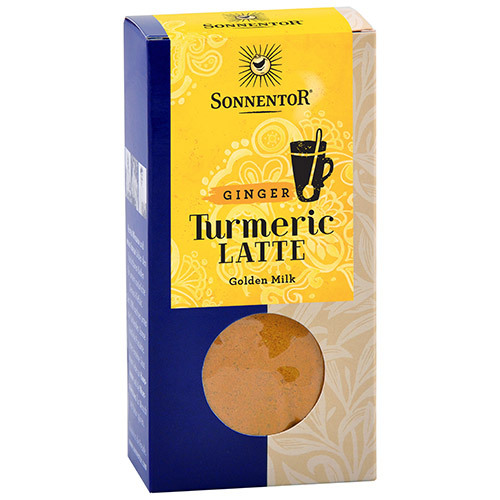 Below are reviews of Sonnentor Organic Turmeric Latte Refill - Ginger - 60g by bodykind customers. If you have tried this product we'd love to hear what you think so please leave a review. Absolutely delicious. Fabulous value for money. I have a cup every night.